As simple as this title sounds, there are few squash players who really achieve this to its maximum. Famous examples could include - John White, Amir Shabana, Mohamed el Shorbagy (especially on the forehand!). There is something different about the way the ball comes off the strings and off the front wall; it sounds different and appears effortless for the player. In the last article I talked about movement fluency and highlighted other great exponents of this art. Both the great movers and the great hitters have something in common: they make it look easy to generate power and also most importantly can change gears with their movement and swing with ease. There are many players who can just 'smash' the ball but cannot then switch to hitting softly or even medium pace. Without feel it is impossible to deliver the ultimate shots. Amir Shabana can measure exactly how much speed to put through the swing including how much squeeze to apply to the grip and at what point to switch on the muscles in his arm but also, vitally, when to switch shoulder and forearm muscles off. Sounds complex doesn't it, but for a great payers this becomes pure instinct. They just know what to do to make the ball move where and how they want. They can feel how much pace to hit the ball with and at which height and angle to achieve the best results. This is a sense of what to do as well as having the technical tools able to deliver it. Put the two together and complete command of the court is possible. When we talk of rhythm it's usually music which is the topic. However, watch any great sportsman and what they do can be seen as rhythmical. The swing process has a rhythm from start to finish, beginning with the racket preparation, through the swing and finishing with the follow through. If this process is broken and lacking in fluency then maximum power and ease of shot will not be obtained. It is useful for the racket preparation to sync with the movement to the ball so that as we move it floats up and back to arrive above the ball just before last step. It is common for the preparation to happen too late or too early causing a separation of swing preparation and movement. It can be useful to count out load as your steps move to the ball so that the rhythm can be felt and heard and link the swing preparation to this: One-two-three-four-hit! The follow through released just after impact with the ball like an exhalation from the lungs. This part of the swing is equally as important as the preparation as it allows ease of power and also aids movement off the shot. Preparation drifts into position to the rhythm of the movement to the ball. As the last stride lands and you step into the shot, link the swing delivery with your last pace � step and hit together. Let the follow through release after the ball has been hit to allow an unrestricted swing and link this follow through to returning to the T.
Prepare and move � step and swing � follow through and recover. Feel this as one process that is rhythmical from start to finish and use music if this helps. The timing of the ball strike also contributes to the cleanly hit shot. Aim to strike the ball at the top of the bounce. Amir Shabana has described it as the weightless moment when the ball is no longer rising or falling. The rhythm described above needs to link to this moment for optimum timing. Tip: Working with a partner, throw underarm a tennis ball into different parts of the court for the mover to aim to catch the ball at the top of the bounce, not before or after. For volleys, aim to hit the ball before it starts to drop too much. Go to meet the ball at the high point in the air. Both of the tips above encourage the player to link the arrival with the swing contact. Let the racket sit in your fingers rather than deep into the palm of the hand. The idea is more of a soft 'hand shake' rather than gripping like a hammer! Ensure the index finger is quite far up the grip creating a nice V shape with the thumb. These two fingers are important for achieving the feel talked about above as they are the main contact points to guide the racket in the correct direction. The rest of the fingers will also rest lightly on the grip and only squeeze just before contact with the ball. Check when you grip the racket if there is a little space between your palm and top part of the grip as you hold the racket with the edge vertical. This soft position before and after hitting the ball is essential to sense the strings on the ball when on contact. Another important part of the soft grip is that it effects the rest if the arm. Nick Matthew and Ramy Ashour have a particularly soft grip before taking the ball short. Both of these players can very quickly accelerate the racket from a short backswing and 'fire' the ball into the nick! In fact my recent experiences of watching the Women's world team Championships really emphasized this. All the Egyptian and Indian players held the racket and hit the ball with complete ease and confidence and they all carried the racket like a paint brush from which the would create their art. Nour El Sherbiny is 17 years old and number 7 in the world! If the ball is anywhere away from the side wall she can finish rallies with ease and precision. Her entire swing (and body) holds no tension at any point and the main muscle energy used occurs just as the ball is struck then instantly releases again. Frustratingly sometimes for European players, the Egyptian and Middle Eastern players all over, tend to hit with fluency and feel. Why? Mainly because the genetic muscle type and personalities wouldn't know how to grip too tight or tense up too much during the hitting process! But also these players are not technically coached in the same way as European players tend to be. In the UK many coaches to dictate what must be done to hit the ball from start to finish whereas in Egypt, as can be seen from the many different techniques, the players are guided how to make the most of their swing with focus on timing and rhythm instead of hours of drilling in straight lines with one swing type! The result speaks for itself. Egypt, in particular, produce natural players who hit the ball very cleanly. Why do the English win at the moment? Because they are physically better and often mentally stronger. I will be aware of the whole body of a pupil when they hit the ball looking for anything which is getting in the way of them playing the best shot. We all react differently to the challenge of trying to play a good shot. Some players rush to the ball, others grab the grip and their spare hand will clench or do something unusual and not useful during the swing process. Detecting this is not easy and takes years of experience but any player can begin to be aware of how their body feels when they hit the ball. Is your shot easy? Why not? Children demonstrate this best especially at a young age. Once given the basics of how to hit the ball, they play their shots with ease and minimal muscle tension. This is because they are not physically 'switched on' yet. But this can be to their advantage as they manage to gain extreme power from tiny bodies! To achieve great striking of the ball and great movement that gets you to the ball, involves feeling and relaxation as well as muscle energy. To develop the balance between these two processes we need to be in touch with our bodies. We need to feel the racket in our hand and feel our feet on the floor as we move. Then it is possible for our bodies to learn what to do and to experience the subtle changes in muscle activation that lead to great striking of the ball. At elitesquash we use very detailed warm ups and functional body exercises to help players find this kind of sensitivity. There are many clever tricks to make this happen but they can only be taught face to face with the player as all players are different and therefore the routines are different for each player. Once you know your body and can feel the swing process from start to finish then ease of power and control will become more natural and all shots will be better as a product. Technique � Is there a perfect style for squash? Coaches and players spend many hours discussing and arguing the part that technique plays in making a great squash player. I would consider myself a very technical coach and put a lot of value on having a swing that allows for the most amount of control over the ball. But technique in squash can vary so much, more than tennis for example. It is possible even to distinguish a �National� style. 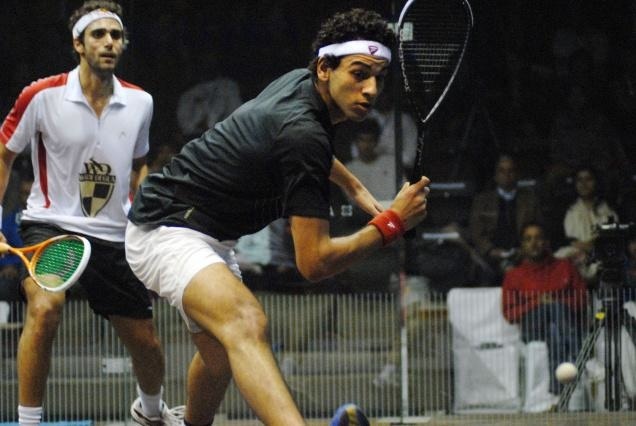 Egyptian players are noted for their relaxed swing and very fast racket head speed. French players tend to have a firmer, short swing; think of Greg Gaultier and Mathieu Castagnet. It is fair to argue that often a National technique will follow the number 1 player of the time. The last 5 years has seen many English players with a �Nick Matthew� style technique especially at junior level where younger players tend to copy their role models. National coaches also have a big influence on the way players in that country hit the ball. The National coach will normally lead the coaching program and decide how the regional and county coaches teach technique and other areas of the game. The main question that arises from the points made above is; is there a best way the swing a squash racket? I still discuss this question with my coaching team on a weekly basis! As a coach you have to at least decide on one way to hit the ball for your pupil therefore you have chosen a technique. Do you refer to the best player in the world at the time or the National coach in your country or someone else who you respect and believe in? In England right now the Nick Matthew era may be coming to an end. Also David Pearson, Nick�s original coach and ex-National coach is no longer involved here. He prescribed the very open faced, soft grip with the index finger very high up the grip. Now we have a new coach, Chris Robertson and a new number 1 in James Willstrop. It will be interesting to see how the majority of players and coaches are hitting and teaching in 5 years from now. It will be different again I think. James Willstrop has a firmer grip with much more of a V shape in the wrist as opposed to the straight line from Nick Matthews index finger to elbow. Will Willstrop be the new swing for young players emerging now in England and other parts of the world? Also, will Willstrop stay at number 1? So to return to the question; is there a best way to hit the ball, it seems the answer at this stage is no. However I would argue that there are elements of technique that are necessary to have the best chance of controlling and attacking the ball. Let's start with the main one; the open racket face. Without this many shots are not possible and control is reduced considerably. Secondly, the racket preparation, striking point and follow through needs to be able to generate power, control and accuracy. The racket preparation can vary according to the shot being played. For example a lob requires the racket head to start below the ball and strike in front of the body but a kill/drop/drive is best played with the racket head starting above the top of the bounce and strike parallel or slightly in front of the body. The follow through also will vary according to the shot being played. For the lob it is effective to use a high, long follow through. The kill and drop is best with a short follow through pointing towards where the ball needs to hit the front wall. 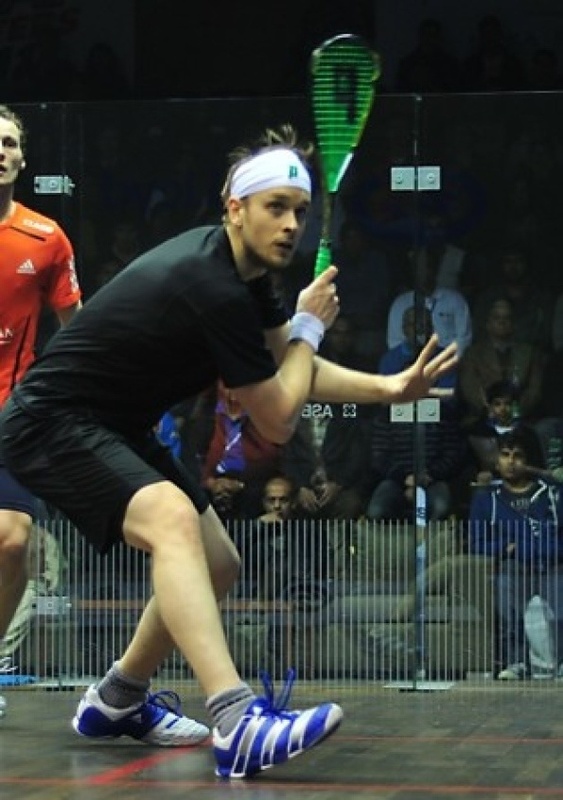 Firstly, the game of squash has changed relatively recently to a fast, attacking style based largely around the volley and explosive hitting and movement. In the days of Jonah Barrington 40 years ago, matches were lasting longer and players where more likely to wear each other down than beat each other with winning shots. Essentially rallies are faster now and more winners are being attempted and hit. This asks players in the modern game to have a technique which can take the ball very early and hit winners from all parts of the court, just watch Ramy Ashour and Mohamed el Shorbagy for examples of this! They have techniques that can change according to which shots the are playing and from which part of the court. They even use different spins on the ball. Secondly, all players have different body types and physical ability. Greg Gaultier suits a short, sharp fast swing with his equally fast movement. James Willstrop uses a slower swing most of the time and choses to control the ball with more variation of pace and accuracy. So Gaultier verses Willstrop becomes �speed verses control�. So if you are a tall player it is useful to consider a technique that suits your build and style of game. Alternatively if you are a shorter build then your swing and game style is likely to be better suited to a more compact technique. The final point I will make on the technique discussion is the repetition factor. Simply, if you hit the ball enough times with a sound technique of some kind it will work! Teaching Mohamed Shorbagy showed me this to an extreme degree. His style is quite different to how I would teach most improving players but he has hit so many balls in practice and matches that his �unorthodox� technique will work for him. Practice makes the main difference once a sound technique is established. So when I am teaching players my first question I ask myself will be: is this technique effective? And could it be improved in any way? Not, this technique is different to mine so I will change it! The racket is prepared early with the head of the racket above the top of the bounce of the ball, wrist in a V shape position shoulder rotated to show the possibility of playing a drive. Strike the ball at the top of the bounce, making the swing move through a diagonal line from the top, through the ball strike and finish with the bottom of the racket edge pointing towards the part of the front wall you want the ball to hit - very important! Notice how my body starts high, with the racket head and moves diagonally down with the racket head. Also notice both knees are bending and the back foot slides to aid recovery out of the shot. Drop from the front: Mainly played after your opponent has dropped or boasted from the back. Key points are: Try to approach the shot with the drive option also in your head. This will help to make your drop not too obvious to your opponent, as you will be prepared for the drive as well. Use a short follow through for drops close to the front wall. Drop from mid court: Mainly played after a loose drive that lands near the service box area. Key points are: Make extra effort to create space and bend low as for the drop at the front. A common mistake with the drop from mid court is to play it with lazy movement. Prepare as for a drive then apply a medium length swing and follow through to execute the drop using all other technical points made above. Your feet at shoulder distance with your body weight balanced on your toes. Keep your racket at chest height in the center of your body ready for any shot. Watch your opponent throughout their shot, especially if they are behind you, simply turn your head over your shoulder and try to identify what shot they are likely to play next, this will give you a good chance of making a sharp first movement. From your T position, split your feet apart landing on your toes to kick off towards the back corner.